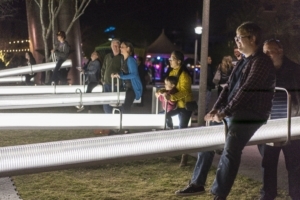 Breckenridge Creative Arts is pleased to announce the return of WAVE: Light + Water + Sound, an exhibition of cutting-edge works of contemporary public art featuring illuminated sculptures, projections and digital art on the riverfront. This free 4-day event offers temporary installations, musical performances, screenings, digital art and eye candy of all sizes for the whole family to experience. Full schedule of events will be posted HERE.